Frankie Dettori will miss the ride on St Leger favourite Bondi Beach because Saturday's Irish Champion Stakes has been brought forward. 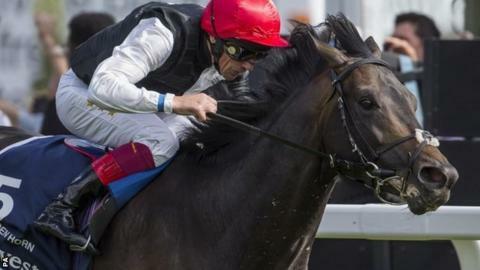 Dettori hoped to compete in the world's oldest Classic at Doncaster on Saturday (15:45 BST) and then fly by helicopter to Leopardstown to partner Golden Horn. But the Irish race has been brought forward 65 minutes to 17:45 because of concerns over the ground. Dettori's agent Ray Cochrane said there was not enough time to ride in both. "Frankie had rides in the first four races at Doncaster, the last one being in the Leger and then we were going to shoot over to Ireland and be there in good time," he said. "Now they've changed it by bringing it forward there's no point thinking of trying to do both." William Buick will come in for the ride on Bondi Beach, trained by Aidan O'Brien. The Irish Champion Stakes is being billed as "the race of the season" with Derby winner Golden Horn and Guineas victor Gleneagles finally set to clash after their planned showdown at York was scuppered by the weather. However, trainer O'Brien has said he does not want to run Gleneagles on soft ground, and Irish officials have moved the race forward because they were concerned the ground could become churned up later on as rain is forecast on Friday night. The race will be held on an outside track on fresh ground, which has not been used so far this season.